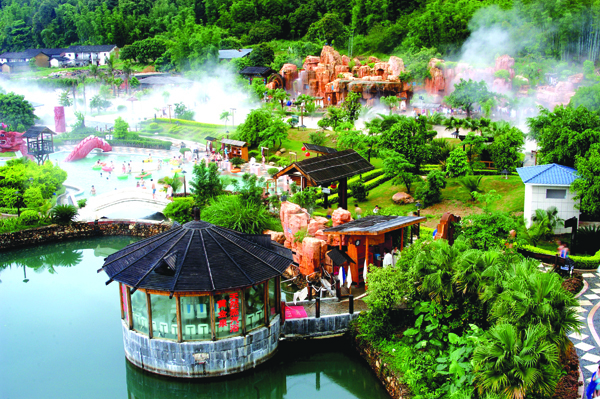 About: Tie Quan • Golden Hot Spring Ecological Resort is a AAAA rating national resort where you can find spa, forest sightseeing, relaxation and entertainment. It is also an ideal place for conferences. 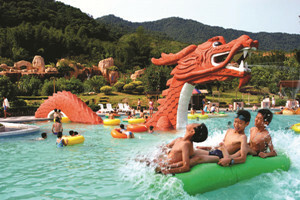 With a total area of 580,000 km2, it is hailed as the No.1 Hot Spring in Asia with Asia’s largest hot spring recreation center and entertainment paradise with large-scale landscaping of waters and mountains. It is situated in Longtian Town, longmen County. 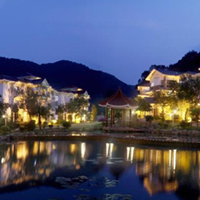 138 km from Guangzhou, 150km from Shenzhen, 98km from Dongguan, 90km from Huizhou and 10km from Longmen County, the resort is easily accessed. The Grand Tiequan Hot Spring is endowed with rich hot spring mineral resources. 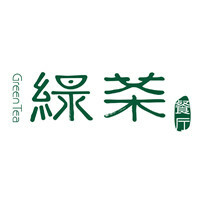 The spring temperature is as high as 78 ℃ with 48 kinds of healthy minerals. With rich Fe, the water looks golden which gives the spring a name “golden spring”. Featuring large flow of spring and many outlets, Tiequan Hot Spring is comparable to the famous “golden spring” in Japan. The resort boasts state-of-the-art facilities, 500 suits and luxury villa houses with distinct features, a banquet hall that can accommodate 800 people, tea art houses, boutique stores, sports facilities, local specialty stores, physical therapy, night clubs, etc.